Blockchain came into existence with the rise of cryptocurrencies, and vice-versa. However, the blockchain technology has gone beyond its use as the underlying mechanism of digital currencies. Today, blockchain facilitates a wide variety of industries like data management, e-commerce, energy, online voting, e-governance, gaming, etc. A few commercial, open source blockchains provide the platform for developing decentralized applications. A blockchain based DApp needs to achieve these following requirements to be called a DApp. For developing a smart blockchain based DApp, we must use a transaction and ledger model. 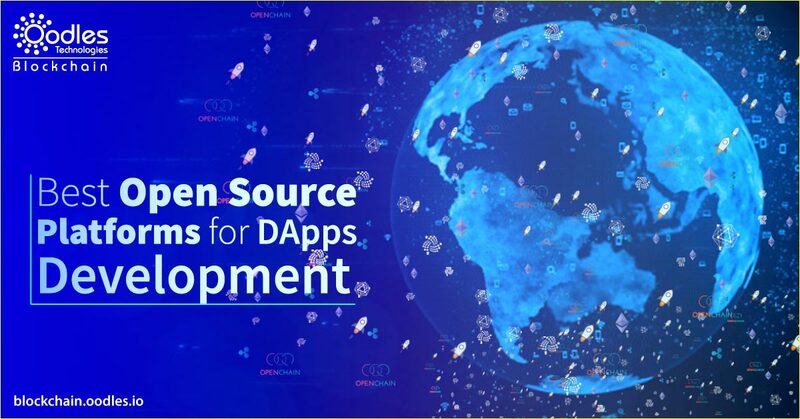 One of the most used Open Source blockchain platforms for DApps development Ethereum is blockchain based decentralized platform intended for creating ‘smart’ smart contracts; applications that run as programmed without any censorship, downtime, fraud or third-party intermediaries. Ethereum has its crypto coin called Ether, which blockchain application developer use to pay transaction fees and services on the ethereum network. Following are the components that make up the Etherum network. EVM: Every node within the Ethereum network runs an EVM (Ethereum Virtual Machine) and carries out the same instructions. Smart Contracts: One of the most critical components of Ethereum, these are high-level coding abstractions integrated into EVM byte code and executed on the Ethereum Blockchain. Developers use various programming languages like Solidity, LLL, Mutan, and Serpent to program smart Contracts. Applications: Ethereum boasts of more than 50 percent of the market share of DApps with around 250 active DApps used for numerous applications like stock market predictions, digital signatures, gaming, social media, etc. Scalability: It utilizes ‘Merkle Trees’ for scalability and optimizing transaction hashing. Hyperledger, one of the most popular open source blockchain platforms for DApps, is a collaborative project maintained by the Linux Foundation. It proposes to expedite the cross-industry collaboration by providing blockchains and distributed ledgers. It also focuses on improving the reliability and performance of these systems to make them capable of being adaptable for global business transactions within major finance, technology, and supply chain companies. EOS.IO, a unique blockchain-powered platform, mainly focuses on decentralization. Blockchain Developers use EOS to develop and deploy enterprise-grade Decentralized Applications. A Cayman Islands Company is the owner of EOS blockchain platform. With EOS blockchain, developers can code the DApp according to the specific needs. EOS makes use of the delegated Proof-of-Stake (DPoS). Owing to the DPoS consensus mechanism, EOS can handle much more transactions than others like ethereum. TRON, intended for the development and establishment of entirely decentralized infrastructure, is an exciting project. It has an enormous blockchain-based operating system which provides high-level support of throughput, scalability, and availability for all public blockchain apps in the TRON network. TRON came into existence to address high transaction fees and low transaction throughput times of cryptocurrencies like Bitcoin and Ethereum. Corda is one of the unique open source blockchain platforms for DApps development, facilitating financial agreements supporting smart contracts. What makes Corda a unique blockchain platform is that it provides global interoperability of public networks that have the privacy of private networks. Corda allows sharing transactional data only with participants that need it, thus, ensuring minimal information leaks. One of the most preferred open source blockchain platforms for DApps and smart contracts, Corda provides a gateway to an ecosystem of completely interoperable decentralized applications for commerce and finance. These are known as CorDapps.